A farmer family cleaning the fresh walnuts. In 2017 autumn, an elderly man, Muhammad Yousuf Bhat from Goripora (Beerwah) fell from a walnut tree in his home courtyard and was badly wounded. The neighbours immediately rushed him to Sher-i-Kashmir Institute of Medical Sciences (SKIMS). After detecting a severe abdominal injury, doctors said if Bhat could live for a day, there are chances of his survival. Six hours later, he succumbed in the hospital. In Batakoot, a dusky Pahalgam village, Ghulam Mohammad Wani and his son were harvesting walnuts from two huge trees in their courtyard. “Suddenly, I heard a sound of a fall and there it was my father motionless,” Tauseef, his son, said. “He was bleeding from his mouth and we drove him to the district hospital.” A few hours later, he was dead. “When we drove him, we knew he was almost half dead,” one of his cousins, said. Perhaps Kashmir’s only organic crop, Walnut is an economy in itself. Growing in most of the periphery in Kashmir and parts of Jammu, in certain areas utilising lands that can otherwise grow nothing, it is sustaining a chain of processing centres across the state. Though delicious and free from walnut blight, Kashmir walnut is unable to compete with the produce from developed countries owing to its small size and colour. Thin-shelled walnuts that fetch better price are quite rare. There has been no change to the traditional pre and post-harvest management practices or the hazardous harvesting. The plantation is sporadic and mostly confined to marginal lands in the foothills. Productivity has never crossed 1.50 metric tonnes per hector. Interestingly, Kashmir’s walnut is sensitive to the extremes in winter and summer temperatures as well as to its duration. The cool growing season delays the harvest. The high temperature of over 38 degrees Celsius causes sun burning to hulls and shrivelling of kernels resulting sometimes in blank nuts. Damages are further aggravated if the humidity is low and temperature exceeds 40 degrees Celsius. The average age of a walnut tree is over 40 years and the average yield per tree is 130 kgs. The entire production is of seedling origin so the product has a huge variation. It grows at an altitude of 900 to 3500 meters. Nuts produced at an altitude of over 1500 meters are considered superior because of the light colour of the kernel and thin characteristic shell. In a bid to get the maximum out of the crop the grower’s commercially exploited its hull, leaves and the stem bark. Walnut hull is used as colouring agent while the leaves are used as fodder. Its root and stem bark are used as dandass as a dentifrice. Hearths consume shell as fuel-wood during winter. Off late, the huge demand in walnut furniture has impacted production as farmers axed aged trees to make quick bucks. The official data suggests that around 2.66 lakh metric tonnes of walnuts are cultivated on 89,000 hectares across Jammu and Kashmir. 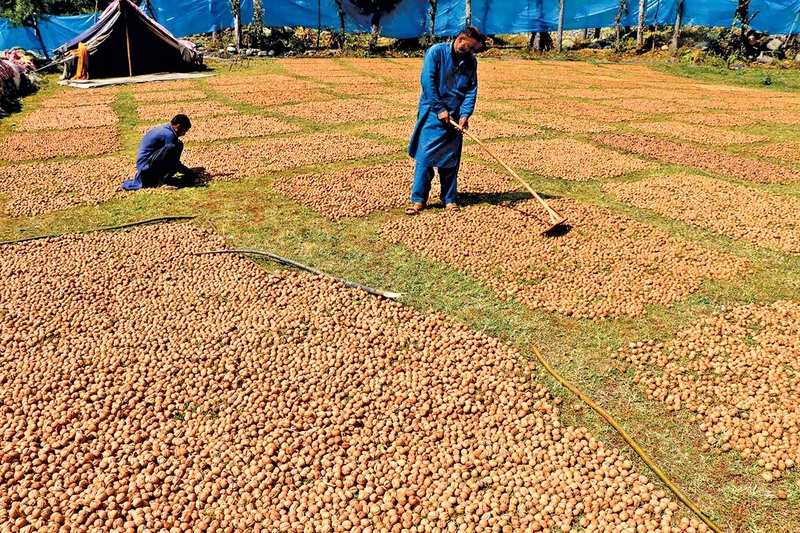 Walnuts constitute almost 98 per cent of the dry fruit that Kashmir produces a year. Kashmiri walnut is an export commodity fetching around Rs 120 crore a year. It is exported in the forms of nuts as well as the kernel. For the last few years, the export earnings are stagnant. While the growers attribute it to the increase in the consumption in the domestic market, traders say the low production coupled with cheap imports is the key factor. The walnut processing is a huge sector and is still expanding. Initially, these units were exclusively managing the walnut processing but now they have diversified into other dry fruits and agricultural commodities. Initially, most of the processing units were operational in Jammu. In fact, the oldest two units managing state’s monopoly crops would operate from Jammu. Now the situation has changed and Kashmir also has a number of such units. While everybody is talking about the economy of the fruit, quite a few seemingly are concerned about the huge human costs, it involves. Since everybody was busy counting the cash, the crisis was left to the doctors to manage the patient load and even write about it. 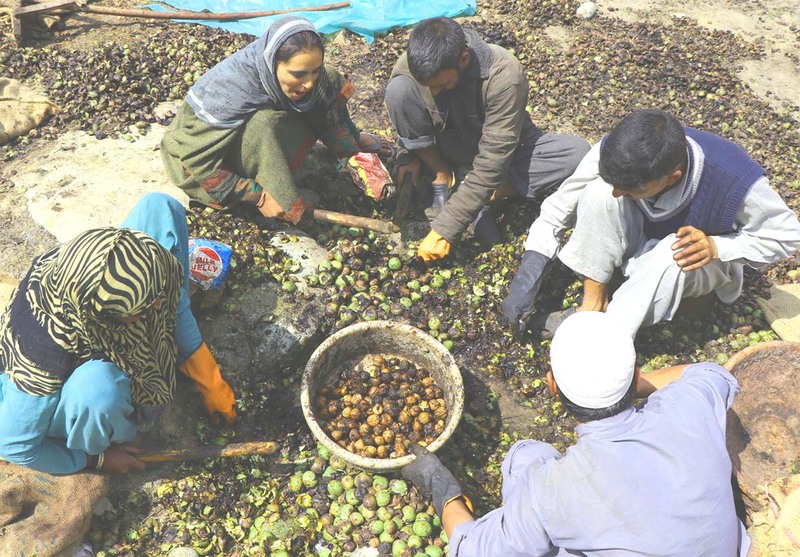 There have been quite a few researches that have been done in Jammu and Kashmir regarding occupational hazards of walnut harvesting. The researchers have found that at the peak harvest season these walnut fall injuries rank fourth among the various injuries reported to the accident and emergency units of the hospitals across the state, especially Kashmir. The injuries sustained in the fall are several: head injury, facial injury and fractures of the long bones. But the worst is that of the spinal cord. In extreme cases, a person with spinal cord injury survives, bed-ridden, immobile for life. If the spinal cord is injured in the neck region, doctors say the patient’s breathing may get hampered to the extent of death; he can have paralysis of all the 4-limbs and immobile. Such patients can only nod their head, talk, chew and swallow the food; for rest of the activities of daily life, they need assistance. These patients cannot even turn in their beds and hence develop bedsores. Some of these patients who are on indwelling urinary catheters can develop frequent infections, urinary stones and ultimately die of renal failure. If the spinal cord is injured at the chest level, breathing and movement of the arms may remain normal but there may be no movement in their legs. The patient will lose control of urination and defecation, thus rendering the patient wheelchair bound for his entire life with a life-long difficulty in passing urine and stools. Perhaps the first of its kind retrospective study was conducted in 2004 by Dr Syed Amin Tabish, former SKIMS Medical Superintendent, and his team. They studied and analysed the case histories of all patients and evaluated the resultant disabilities and identify methods to prevent such injuries. The study listed 87 patients having injuries due to a fall from walnut trees were admitted in the Accident and Emergency Department of SKIMS between 1999 and 2002. Forty-one (47.1%) of them were admitted on September, 31 (35.63%) on August, 10 (11.5%) in October and five (5.7%) in other months. The study revealed the cervical spine injuries were most common (27.50%), followed by brain contusion (26.43%). The ratio of mortality was 24.13%. About 18% of patients got permanent disability (paralysed for life). Almost a similar study published by Academic Journals in 2013 was conducted in 2006 by Medical College Srinagar, which almost revealed somewhat analogous results. The research was carried out during the harvest and the immediate post-harvest season for walnuts (August to October 2006). This study comprised 106 patients (105 male) with injuries attributable directly or indirectly to walnut harvesting. This excluded all those patients who could not make it to the hospital or were treated at rural health centres. Of them, 104 cases had fallen from walnut trees and two were injured while being struck by the foliage and branches of trees. Of them, six died in the hospitals. More than a decade later after Tabish’s pioneering research, the number of such cases might have gone up. The streak of these cases remains to report to the hospitals, every harvest. Tabish’s paper suggests the reasons behind these incidents are many, but the main reason is the use of traditional methods by the farmers for harvesting. They lack any formal training or technique of such harvest. As the walnut matures, it gets loosened near the joint of pedicle thereby leading to fruit drop in the months of August and September. The fruit growers can thus collect their produce without much effort but it leads to a considerable loss on account of misplacing and fruit damage. In order to prevent such loss, a grower or an entrepreneur of the walnut orchard adopts cheap, economical, speedy but risky practices for early walnut harvesting. A walnut tree reaches a 30-meter height. The traditional method of harvesting envisages climbing the tree, barefoot. Placing himself on the tree, the farmer uses a long stick, locally called laaunz, to hit the fruit-bearing branches. Since the fruit is cumulated to distal parts of the tree branches, which are frangible due to the hollow structure, the very length of the branch necessitates the use of both hands. Attempts are also made to dislodge the fruit by vigorous shaking of the branches. The fruit is harvested before it attains full maturity, and hence, at a stage when it tends to be attached more tenaciously to the tree, it requires more force to be exerted to detach it. With such practices, it is common for the climber to lose his balance, and due to lack of any support, fall to the ground and get injured. Unlike all other trees especially almonds, walnut trees have slippery outer. Studies suggest adults and young boys are the chief victims. The reason for this gender predilection is that the task of walnut harvesting is traditionally fulfilled by males. Women usually collect and process the fruit. SKIMS doctors say they have noticed that these walnut tree climbers are the sole earning hands of their families. A labourer by profession, Yousuf was one such example. He is survived by seven children and his wife. Since his death, the family, including five daughters and two sons, is living a penurious life. For those who manage to survive, “lose their will to live sometimes” because of their status of being a burden on their families. The cost incurred on each patient who needs surgery for correction of bony deformity of the spine is approximately Rs 50,000. These patients have a long stay in the hospitals and longest bed occupancy rate. “Such patients need to be rehabilitated not only in terms of their neurological recovery but also need occupational rehabilitation,” one doctor said. “These patients and their families become depressed in life and develop various neuropsychiatric problems which include suicidal tendencies also.” say the doctors. The walnut tree grows in areas of temperate climate and is being cultivated in more than 39 countries. Walnut trees are found almost everywhere in Kashmir and are economically important. The fruit of the walnut tree is used both in the food and drug industry, its wood is widely used in the furniture sector, and its leaves and roots are utilized in dye manufacturing. Kashmir’s is India’s main walnut basket but, of late, Arunachal Pradesh, Himachal Pradesh, and Uttrakhand have also started growing the fruit. What is the way out? The issues should have concerned the engineers serving the agriculture university. Even the horticulture department has no idea about the crisis. There is no record with the department that would offer an idea about these painful deaths. There has never been any effort of devising some training capsule that will offer about the safety concerns of these brave heart harvesters. This is not something Kashmir is facing alone. Earlier the same crisis was reported in Kerala during coconut harvesting. But the engineers in the south Indian state create a tool that has almost stopped any casualty. Has any Kashmiri engineer an idea? Till somebody gets the Eureka moment, the government may have to offer some relief. The horticulture department must create a budget head to help the families that have lost their earning hand in harvesting. Some help needs to be extended to those farmers who become immobile for their life. Farmers can be provided safety nets that can be laid around the tree in such a way that if there is a fall, there is no death. A scheme can be devised to create a net that can be permanently put under the tree so that the fruit falls on its own and is not getting wasted or misplaced.